Ride my bike east for a month camping wild, and remembering at all times to truly be where I am. If you want to read a bikepacking article about how a wild boar with very big teeth passed ten metres from my tent in a deserted almond grove, or about how I almost got blown off a French bridge because it was blowing galeforce, or about being so cold in a snowstorm that I thought my teeth were going to crack with all the rattling, then stop reading now. All these things happened, but my focus will be on what these and other things do to the mind. It was my third day on the bike. I had climbed a 20km mountain pass to get into the famously beautiful region of Cazorla in the South of Spain. I was feeling pretty chuffed with myself as I was sitting on some very old stone stairs with an aquarius, my penknife, some bread, tomatoes, cheese and ham. The late afternoon sun was heating my body, and on the other side of the street the river was flowing ever so peacefully through Pontones, one of these small villages that you just fall in love with for no particular reason. I was happy! I was full of joy and couldn’t stop smiling even as I was chewing away – life in that moment was perfect. But then what happened? A big Ford Transit van parked right in front of me, the lovely river view was gone – all I could see was white metal sheeting. My smile faded slightly, but I could still feel the sun on my body, and decided that I wasn’t going to let such a minor detail as a Ford Transit spoil my perfect state of mind. But then what happened? The driver jumped out of the van, and left the engine running. No more birdsong, no more bleating from the goats nor the murmur of slow village life. In my mind, there was now a raging battle taking place. In a matter of seconds I had gone from peaceful to judgemental, regretful, angry, and self-rightous. That’s all it takes, a white Ford Transit van, to ruin my perfect state of mind. And here lies the seed of my motivation for this bikepacking journey – life seems to be full of Ford Transit vans, and my plan was to see if I could explore the mind through bikepacking. It’s all in the mind, they say, so could I learn to deal better with the Ford Transit vans of life? I had a whole month on my own on the bike with no goal whatsoever, other than trying to stay present in as many moments as possible, which, I soon found out, would prove to be an exceedingly difficult task. It was the middle of March, and my first week, crossing the southern part of Spain was freezing cold, which wasn’t helped by my staying high, always looking for mountains. Every night the temperature dropped as far as 7 degrees below zero, which my sleeping bag wasn’t quite up for. During the day I would often freeze so much that I would find my self unable to focus on anything other than than how the cold was gnawing at my bones. I would stare intensely at the kilometres on my cycle computer, doing mental countdowns to the next café over and over again, hardly noticing any of the landscapes going by. I was obsessed by, and totally in the grip of my bodily sensation of clenching coldness. In my few fleeting moments of being present and observing my mind, I found it interesting that this contraction, this coldness, had complete hold of me mentally as well as physically. I seemed unable to keep an open, joyful and curious state of mind. All I knew how to do was suffer in the discomfort, and my automatic response was to do what most cyclists are absolute masters at: grit my teeth and get on with it. The problem was, that during the last couple of years, I have gradually come to the conclusion that I don’t want to go through large portions of life gritting my teeth. This idea of enduring and conquering is a strongly embedded value in our culture; it’s seen as a great virtue to possess these qualities, to be strong and resolute. I, on the other hand, am convinced that these are bad habits, that don’t contribute to much good, either on the personal level or in the world, and I would like to get rid of them. This doesn’t mean that I cannot climb mountains in the cold and the discomfort. I most certainly still want to do that, but with a different mindset. I cycled through Spain, France and part of Italy, and it seemed as if the evolution of my contemplations ran parallell to the changing characters of these countries. 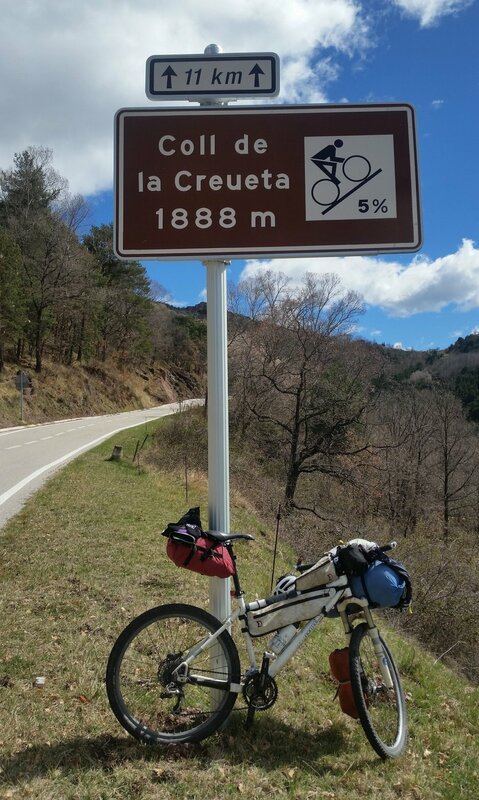 I rode 1,310 kilometres through Spain, and it is a savage place. Get away from the crowded coast and into the scantily populated areas deep inland, and you will often cycle through wild landscapes with hardly any cars, inhabited by refreshingly rough people with real soil under their nails. They don’t use many words, they clearly don’t read fashion magazines and I am convinced that a few of them were horse whisperers, or maybe rather donkey or goat whisperers – a skill I would very much like to learn. In fact I could almost say that this was my ambition for this journey: to listen to the silence and softly whisper to the pains and aches, the cold bones, the headwinds and the steep mountain roads. As I made progress on my northbound course, I slowly got better at identifying my ever-changing mindstates, and when I caught myself in some contracted, tooth-gritting, frame of mind, which seemed to happen a lot, I would start a discussion with this mindstate, telling it to go away, that it was unwanted and could just beat it, because I had decided to be joyful instead. Needless to say, this didn’t work. I did however make one important discovery for myself. I found out that everything – and I mean EVERYTHING – is in constant flux and change. Mindstates shift in the blink of an eye, so do landscapes, weather and the body. This impermanence was strangely comforting; it gave me glimpses of realisation that there really wasn’t much to hold onto, or to get all identified with and caught up in. I frequently thought about resilience, especially when I was so cold in my sleeping bag that I had to put all my clothes on, including my gore-tex jacket on top of my down jacket, while the snow slowly covered my whole tent. All of us who go bikepacking and do other outdoor activities are usually very resilliant when it comes to external challenges like bad weather, the cold, physical hardships and so on – we can quite easily endure circumstances that the majority of people would find an impossible challenge. But my question is, is this resilience to difficult external challenges transferable to other areas of our lives? Can we apply it to our inner life? To difficult emotions and thought patterns? As I was getting closer to the snow-clad Pyrenees, this colossal mountain range which acts as a barrier between the Iberian peninsula and the rest of Europe, everyone I met started sowing seeds of fear and anguish in my mind. It was unbelievable that everyone I met said this, but what was even more unbelievable, was that I almost started believing it myself. I have cycled quite a lot in the Pyrenees, I have climbed all the famous Tour de France mountains, and I live just beneath Spain’s highest mountain, Mulhacén, and my favorite training ride in Sierra Nevada goes higher than anything in the Pyrenees, and yet here I was, days before the actual climb, getting all worked up about it. The big day came and I started out full of joy, happy to finally meet my fears, and also, I remembered, I actually like climbing over big mountains. The climb over the mountain pass into France was beautiful, and I enjoyed it, of course I did, but I found the whole build-up really interesting. And as it turned out, when I was aproaching the Alps, and had to climb over them to get into Italy, exactly the same thing happened. Everyone I met talked as if I was attempting to cross the South Pole, and again my mind was filled with nerves. And of course the climb was both beautiful and enjoyable. So what is this ridiculous thing that our mind does? It does many unhelpful things. First of all it is not at all present in the moment, it has jumped way ahead of itself into the future. Second it builds up an expectation, and puts a stressful label on that expectation – creating a storyline. I realized that I do this all the time: anticipate some future event, create a story, and in this way cause myself a lot of unnecessary stress. Riding through super civilized and sophisticated France, with all its beautiful and well kept old villages, my mind started calming down, and in between my overdoses of croissants I got better at observing my mind, until one day I finally had an ephiphany. I had cycled 70 kilometres over very hilly terrain and with a strong headwind the whole time, and decided I would do 20 more, then camp. All day there had been a village about every 10 kilometres, so I assumed I would soon get to the next village where I could fill up my water, which was essential before setting up camp. After 20 kilometres, there was still no sign of a village, so I had a look at the map, and was shocked to see that there were another 40 kilometres to the next village. My heart sank, not because I wasn’t capable of cycling another 40km, but because I wasn’t expecting them, and to be fair, it was pretty hard going, with the strong headwind and the constant up and down. I had no choice but to continue, so I got back on my bike in a foul mood, and then, as if things weren’t bad enough already, I had to climb up a huge hill, at least eight kilometres, and I was fuming. The legs were fine – it was the spirit that just wasn’t up for it. It was uncomfortable: I was inching my way up the hill at about 8km/h because of the wind, which meant it was going to take me a whole hour to get to the top, and there would still be 30km to go. I was not a happy camper and my backside was hurting. I found myself fidgetting on the bike, not sitting still, looking around, trying to meet the eyes of every driver that passed me, looking at the unchanging kilometres on the cycle computer, looking at the un-changing landscapes. Then it became obvious to me that I was doing everything I could to avoid being where I was. I was looking everywhere for distraction from my situation, and all I achieved by doing this was an unsatisfying restlessness. I decided to give it a try, so I aligned my body on the bike, relaxed my shoulders and arms, relaxed my neck, and kept it in line with the rest of my spine. I covered the cycle computer, and brought all my attention to my breath. I noticed that my breathing was shallow. I started following my breath, feeling every inhalation all the way in to my abdomen, and with every exhalation I said to myself “let go” as I let the breath out of my body and loosened my shoulders. I didn’t look at the cars, nor the landscape; I was only focusing on my breath and the relaxation of my whole body. What can I say? It became one of my best riding experiences on the whole journey, and later I repeated this exercise whenever I got agitated. It worked wonders every time. All the previous days when cycling wasn’t great, because of rain or snow or something else, I realized that I had been paying too much attention to my unhappy mind. This was after all the whole point of the trip – to explore my mind. But then I would start arguing with my mind, commanding or persuading it to be more joyful. Let me tell you once and for all – that doesn’t work! Although I was of course only interested in the noble task of exploring the mind, I reluctantly have to admit that my mind took a leap of joy when I got into Italy and the Italian men fully lived up to my stereotyped expectations. What can I say, hundreds of flat kilometres flew by very quickly as I enjoyed the view of various tanned, well-shaved muscular legs and small, elegant Italian backsides. My journey was coming to an end one week earlier than planned because my six-year-old daughter was crying on the phone, which broke my heart, and I just wanted to get home to hold her and whisper sweet things into her beautiful curls. Three weeks pedaling on my own and living in my beloved camoflage-coloured tent had marked me. I had learned to use completely new tools in my way of handling life and myself. All my life I had used a good overdose of willpower and grit to reach my goals, goals which had always been in the form of external achivements. As I got on the plane to Málaga with my bike, there was a deep sensation of homecoming in more than one sense of the word. I was rediscovering that place of wonder and peace inside myself which so easily gets lost in the hectic race of doing and achieving and projecting our hopes and dreams onto the future, onto the next moment. We always think the next moment is going to be better than this one, and far too often we perceive this moment as an obstacle to be overcome, so that we can get to the next, better moment. I found that there was always relief in the present moment, and that most of the agitation of life comes from the storyline we make up, not from anything happening just in that moment. I hadn’t lost my grit and determination, but a new strong motivation had arisen to soak my old steely-cold willpower in soft, fluffy and flexible tenderness. Looking down from high above on the landscapes I had pedaled trough, I reflected that throughout the whole journey, I had consistently been coming back to the contemplation of just letting life flow through me. On the final morning, when I boiled up some water for my cup of tea, the label on the Yogi teabag said: “Life is a flow of love, your participation is requested.” I thought that message was the perfect fluffy end to this contempative journey.